Welcome to the 4th and final guest post from Cris at Fantasyomatic.com. He's been taking a look at the 2010 schedule and developing a Fantasy Points Against score for each NFL team by position. I've posted his review of QBs, WRs and TEs, so now it's time for RBs. If you've been following along in this series you know that I post the top 3 teams here and you can find the rest on Fantasyomatic.com when it gets posted on Friday. So without further ado, enjoy this last article from Fantasyomatic.com. Welcome to part four, the final installment in a series of draft prep articles leading up to training camp. This week the focus is on fantasy RBs with information on lots of running backs in the league, their offensive lines, their strength of schedules and where they stand in the depth charts. We ranked all 32 teams based on several factors called 'FPA Score'. We will break down each team and profile each RB candidate. You will also find helpful information on 2009 Yards Per Carry, 2009 Touches, 2009 Red Zone usage, 2010 Strength of Schedule, and 2010 Fantasy Playoff schedules. Don't worry about the Fantasy Points Against data just being grabbed from 2009; the engine used here has been hard at work cranking out "defensive ranking against fantasy position" projections all spring. The "FPA" values you see include 2010 adjustments for draft and free agency additions, coaching changes in the offseason, defensive scheme updates, daily fantasy news updates, and up to the day depth charts. In addition, the FPA values are also weighted against their strength of opponents in 2009 and then again against their strength of opponents in 2010. What to look for: Players with high yards per pass attempt (YPA) and trends of low FPA ranks against especially during weeks 14-16 (fantasy playoffs). A good combination of low ADP and a high rank in FPA with a lot of involvement in the offense = value. Also watch for mentions of a high red zone score percentage (RZS%), which denotes a TE that's involved in a lot of red zone scoring. Rookie RB Ryan Mathews will be a popular sleeper in fantasy football this season, and while it's not good fantasy form to grab a rookie RB too high and expect big things from him, there are some pretty interesting factors that make Mathews look like he may be a solid top end RB2. 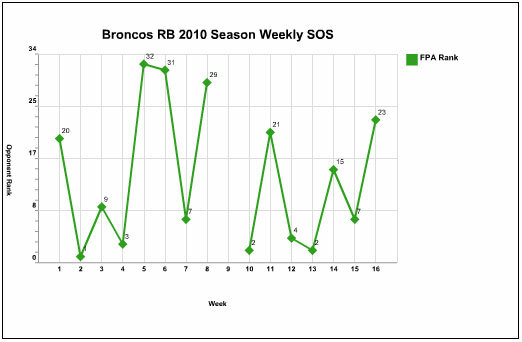 First, he has a very impressive #1 overall SOS ranking in our proprietary database for all RBs. Chargers coach Norv Turner estimates that Ryan Mathews will have 290 carries and 40 catches this season. Based on that 290-touch prediction, Mathews will top 1,300 all-purpose yards if he averages a pedestrian 4.0 yards per carry and 7.5 yards per catch. 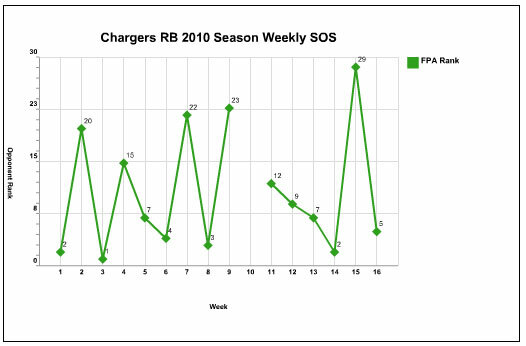 As a team, San Diego scored 17 rushing TDs in 2009 and averaged 3.4 ypc, so even a slight increase can make him gold. The reception total has been overly optimistic all along with Darren Sproles locked into third downs and Mathews catching only 19 passes the past two years at Fresno State. Mathews will have a tough hill to climb unless the Chargers' offensive line improves upon a 3.4 ypc average (worst in the NFL last season). Pro Bowl guard Kris Dielman and center Nick Hardwick are excellent, but as the contract dispute between left tackle Marcus McNeil and the front office rages on, a holdout appears likely. This is certainly something that could take some air out of this balloon. Kevin Acee of the San Diego Union-Tribune confirms that McNeill is next in line for a contract extension with Antonio Gates' out of the way. However as poor as L.T was last season, SD still credited 50% of their Red Zone TDs to their RBs in 63 appearances. If this play calling continues and the offensive line improves just a little bit, then you can expect good things from Mathews. Mathews has been rising rapidly in ADP ranks, starting at around 40 and now appearing as high as 17 overall in some expert drafts. The reason we have SD ranked #1 is because they have only one matchup against the toughest 5 defenses against RBs, and although that comes in a critical week 15 game, their killer top 5 weakest matchups in weeks 14 and 16 make up for it. You can also expect an excellent start for the rookie (as long as he gets to camp on time) since 5 out of the first 8 weeks are matchups against the easiest 10 defenses against fantasy RBs! Then, after their bye week (and a nice late Week 10 bye to help counter the "rookie wall"), they revisit 4 of the weakest 10 teams again to finish the season. It really doesn't get better than this if you value RBs and SOS. The 49ers' offensive line is the headline story of their offseason after adding line coach Mike Solari and two solid first-round picks (Anthony Davis and Mike Iupati). While Davis is more of a project slotted to start at right tackle, Iupati has All-Pro potential as an interior lineman. The rookies figure to be part of the 49ers' battles for starting spots in training camp at right tackle and left guard, respectively. This depth is still huge for Frank Gore. Gore runs well in a zone scheme that Solari will bring to SF, yet he is also a huge impact receiver with over 400 yds and 3 TDs through the air in 2009. Gore has never played a full 16 game season, but if he does he is elite. 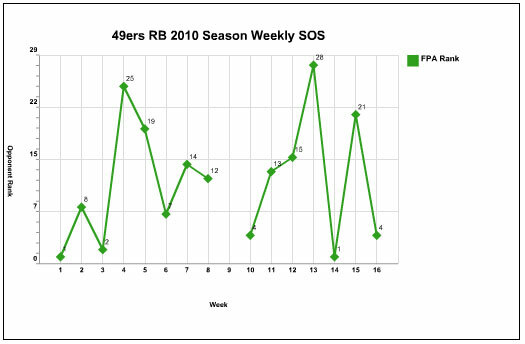 For example, in 2009 Frank Gore averaged more fantasy points per game than MJD. Keep in mind that he has never missed more than 2 games in a season, so it is not an extreme concern, just expect that you will not have him for possibly 3 games (including the bye) and if you can live with that, he is a great value. The Sacramento Bee's Matt Barrows does not believe rookie Anthony Dixon will unseat Glen Coffee for the primary backup job this summer. "At least not at the start of the season," said Barrows. Coffee is already adept at blitz pickup, so he'll have a sizable advantage on the No. 2 job in training camp, making Coffee a better use of a late-round fantasy pick than Dixon. Gore will jump out to a great start with all three of his first games against bottom 10 defenses against fantasy RBs. If you look closer, you will see that he actually faces the projected worst and 2nd worst teams against RBs in those first three weeks. Then, after a couple tough matchups, things settle down and eventually ease into an amazing weeks 14 and 16. Knowshon Moreno totalled 1160 total yards with 9 TDs in 2009, but he had a chance to do a lot more. He only averaged 3.8 ypc and also lost 4 fumbles. Keep in mind he missed training camp due to his hold out and suffered an MCL injury in the preseason. He also wore down quite a bit to 2.7 ypc over the last 4 games. Overall he had less than 250 carries as a rookie, but had 33 broken tackles and was active in the passing game. NFL Network's Michael Lombardi believes Knowshon Moreno could "set the league on fire this season" as long as he stays healthy. Lombardi is tight with Josh McDaniels, so he could be getting his optimistic outlook straight from the head coach. Much will depend on Demaryius Thomas emerging as a legit downfield threat to open up running lanes for Moreno. Beat writer Mike Klis has already issued a "fantasy alert" on Moreno, and McDaniels has predicted an "impact" role in the passing game. However, McDaniels likes using RBBCs so Correll Buckhalter will still see action, just not enough to carry him on your roster. Buckhalter actually made more with his opportunities last year with his 5.5 ypc. Despite this, he got only 3 goal line attempts while Moreno had 14. Keep in mind that Denver gave 76% of its Red Zone TDs to RBs in 2009 so if that continues, Moreno could benefit big time. In the past, Denver could plug anyone in at running back, or along the offensive line, and still have success because of the zone-blocking scheme. However, during the offseason Denver moved toward a man blocking "power" scheme which should be better for Moreno. Moreno will have a shot to get his legs under him with three top 10 matchups against soft defenses in the first 4 games. There is a wicked stretch of 3 out of 4 very bad matchups before Denver's week 9 bye. But if you are savvy, let Moreno owners in your league struggle through some poor performances weeks 5-8, then when they are looking for a RB2 replacement for Moreno during their Week 9 bye, offer them a trade for Moreno and enjoy an incredible bounce back late season schedule where his value may hit a season high going into the playoffs. Agen Bola indo11.com reported, that Werder Bremen are set to wrap up the deal for Argentine full-back Santiago Garcia. The 25-year-old defender, who spent the last season at Palermo, is a free agent and he looks set to join the Bundesliga outfit. General manager Thomas Eichin has confirmed that the Weserstadion outfit is in talks with the highly rated footballer. “We have interest in him, but the deal has not been concluded,” Eichin explained to Bild. Werder have already signed one player on a free transfer this summer, having snatched forward Franco Di Santo from Wigan Athletic, and they look ready to boost their ranks with another Argentine footballer. Santiago Garcia began his career at Rosario Central and went on to join Palermo in the summer of 2010. as reported by Indo Eleven. After appearing in just three Serie A games during his first year in Italy, he was farmed out on loan at Novara, where he performed pretty well before returning to Renzo Barbera last summer. Agen Bola indo11.com reported, Tottenham are pondering a late move for Lazio playmaker Hernanes. Spurs are still hoping to sign a creative midfielder after missing out on Willian, especially since everything suggests Gareth Bale will soon be leaving the club. As a result, Tottenham boss Andre Villas-Boas is hoping to lure long-term target Hernanes to White Hart Lane before the summer transfer window closes. And while Lazio chiefs are reluctant to negotiate the sale of their prized asset, they are not in such a good position after the talks over a new contract broke down. Meanwhile, it is believed the Brazilian midfielder would be interested in a switch to White Hart Lane, with the Biancocelesti proving unable to mount a serious title challenge in Serie A. as reported by Indo Eleven. Despite being mostly used as a central midfielder, Hernanes has been scoring goals for fun in Italy, having bagged 20 goals in 66 Serie A matches. Agen Bola indo11.com reported, Stoke City F.C. have completed the signing of Morocco international winger Oussama Assaidi on a season-long loan deal from Liverpool..
Assaidi, 25, joined Liverpool from Dutch Eredivisie side Heerenveen for an undisclosed fee — believed to be in the region of £2.3 million – in August 2012, but has failed to establish himself in Brendan Rodgers’ first-team. as reported by Indo Eleven. The Morocco international has become Mark Hughes’ fourth signing of the summer following the arrivals of Erik Pieters, Marc Muniesa and Juan Agudelo. Assaidi, who tallied one assist in 12 appearances in all competitions for the Reds last season, is absolutely delighted with the move. Berita sepak bola terkini dari Agen Judi online terpercaya indo11.com - Manajer Chelsea Jose Mourinho tengah mempertimbangkan menghukum pemain yang melakukan diving dengan mencadangkan pemain tersebut. Menurut sosok berjuluk The Special One ini, diving adalah tindakan memalukan dan harus ada upaya serius untuk memeranginya. Mourinho belum pernah mencadangkan pemain yang melakukan diving. Ia hanya mengkritik pemain tersebut, seperti yang pernah dilakukannya saat melatih Didier Drogba atau Arjen Robben. Perkataan Mourinho ini tak lepas dari kartu merah yang diterima Fernando Torres saat melawan Tottenham pekan lalu setelah melanggar Jan Vertonghen. Mourinho memrotes kartu merah Torres tersebut dan menilai Vertonghen bereaksi berlebihan. Agen sbobet terbaik indo11.com - Ia juga buka suara terhadap kartu merah pemain Celtic FC Scott Brown saat melawan Barcelona pada pertandingan fase grup Liga Champions, Selasa lalu. Mourinho menilai kartu merah terhadap Brown tersebut sedikit tak adil. Berita pertandingan sepak bola terkini dari Agen Bola terbaik indo11.com - Pelatih AC Milan, Massimiliano Allegri, mengaku bosan dengan pernyataan seputar kehebatan Andrea Pirlo dalam lapangan sepak bola. Hal tersebut diungkapkannya menanggapi performa Pirlo yang sukses membawa Juventus mengalahkan Milan dalam lanjutan Serie-A, Minggu (6/10/2013). Pirlo didaulat menjadi pemain terbaik pada laga yang berakhir 3-2 tersebut. Ia pun sukses mencetak satu dari total tiga gol skuad La Vecchia Signora melalui tendangan bebas pada menit ke-15. Pirlo sebelumnya berlabuh ke Turin dengan status bebas transfer lantaran manajemen I Rossoneri enggan memperpanjang kontraknya yang ketika itu berusia 32 tahun pada 2011. Salah satu alasannya, Milan ditengarai menganggap masa keemasan Pirlo telah berakhir seiring usianya yang tak lagi muda. Agen Judi terpercaya indo11.com - Namun, asumsi tersebut ternyata salah. Pirlo tetap mampu menjadi salah satu pemain kunci Juventus hingga saat ini. Bahkan, pada musim perdananya dengan Si Nyonya Tua, Pirlo sukses mempersembahkan scudetto. Berita olah raga terbaru dari Agen Bola terpercaya indo11.com - Pelatih Chelsea Jose Mourinho menilai timnya bekerja keras untuk meraih kemenangan 3-1 atas Norwich City pada lanjutan Premier League, di Carrow Road, Minggu (6/10/2013). Pada laga itu, Chelsea unggul lebih dulu melalui Oscar pada menit keempat. Tuan rumah sempat menyamakan kedudukan melalui Anthony Pilkington pada menit ke-68. Akhirnya Chelsea menang berkat gol Eden Hazard (85') dan Willian (86'). Hazard dan Willian bermain sebagai pengganti Ashley Cole (75') dan Juan Mata (81'). Menurut catatan Premier League, sepanjang pertandingan, Chelsea melepaskan delapan tembakan titis dari 16 usaha, sementara Norwich menciptakan tiga peluang emas dari 10 usaha. Agen Bola terbaik indo11.com - Dengan kemenangan itu, Chelsea duduk di posisi ketiga klasemen sementara dengan nilai 14, atau kalah dua angka dari penguasa sementara, Liverpool. Berita pertandingan sepak bola terkini dari agen sbobet terbaik indo11.com - Pelatih Juventus, Antonio Conte, puas dengan keputusan memainkan Sebastian Giovinco pada laga kontra AC Milan, di Stadion Juventus, Turin, Minggu atau Senin (7/10/2013) dini hari WIB. Giovinco menjadi pemecah kebuntuan Juventus saat kedudukan masih 1-1. Gol yang mengubah skor menjadi 2-1 untuk Juventus, diciptakan Giovinco terjadi setelah dua menit ia masuk menggantikan Fabio Quagliarella. Juventus pada akhirnya menang 3-2 hingga pertandingan berakhir. Agen Judi terbaik indo11.com - "Saya pikir saya akan membuat pergantian pemain yang baik saat melawan Galatasaray pada Rabu lalu. Tetapi kemudian, kami kebobolan dan semua orang mengatakan saya telah membuat keputusan yang buruk," kata Conte. Berita pertandingan sepak bola terkini dari agen sbobet terbaik indo11.com - Pelatih Arsenal Arsene Wenger mengaku sempat ragu-ragu sebelum akhirnya memutuskan untuk merekrut gelandang Mathieu Flamini (29) dari AC Milan. Menurutnya, keraguannya terhadap Flamini sejauh ini terbukti tidak benar. Arsenal merekrut Flamini pada Agustus 2013. Ini adalah kali kedua Flamini menandatangani kontrak di Arsenal. Sebelumnya, ia bermain untuk Arsenal pada 2004-2008. Agen Judi terbaik indo11.com - Sementara itu, Flamini mengaku tak pernah merasa jauh dari Arsenal dan senang bisa kembali. Menurutnya, ada urusan yang belum selesai di Arsenal. Berita olah raga terbaru dari Agen Bola terpercaya indo11.com - Penyerang Barcelona, Neymar da Silva, menilai Lionel Messi akan tetap menjadi figur penting bagi skuad Blaugrana meski saat ini tengah menepi karena cedera. Messi, kata Neymar, akan selalu dirindukan oleh para pemain Barcelona di dalam lapangan. Lionel Messi harus absen selama tiga pekan setelah mendekap cedera otot paha saat membawa Barcelona mengalahkan Almeria 2-0 di Liga BBVA, Sabtu (28/9/2013). Meski begitu, tanpa kehadiran bintang asal Argentina itu, Barcelona sukses menuai kemenangan di dua laga terakhirnya melawan Celtic (1-0) dan Valladolid (4-1). Neymar mengaku senang dua kemenangan tersebut dapat diraih timnya di tengah absennya Messi. Akan tetapi, mantan pemain Santos itu menilai kehadiran Messi akan tetap dinantikan rekan-rekannya untuk mengembalikan peforma terbaik Barcelona. Agen Judi terbaik indo11.com - Barcelona berada di puncak klasemen sementara Liga BBVA dengan poin sempurna dari total delapan laga. Pada pertandingan selanjutnya, skuad asuhan Gerardo Martino itu akan menantang Osasuna di El Sadar Stadium pada Sabtu (19/10/2013). Berita sepak bola terkini dari Agen Judi online terpercaya indo11.com - Striker Atletico Madrid, David Villa, dipastikan absen membela tim nasional Spanyol pada lanjutan kualifikasi Grup I Piala Dunia 2014 kontra Belarusia dan Georgia pada Jumat (11/10/2013) dan Selasa (15/10/2013), setelah mengalami cedera. Untuk menggantikan posisi Villa, pelatih Spanyol, Vicente Del Bosque, pun memutuskan untuk memanggil striker Swansea City, Michu. Ia akan mengisi posisi lini depan Spanyol bersama Fernando Llorente dan Roberto Soldado. Ini adalah kali pertama Michu dipanggil oleh skuad La Furia Roja. Salah satu alasannya ditenggarai karena performa apik pemain berusia 27 tahun itu yang hingga saat ini sudah mengemas total 27 gol bagi Swansea sejak bergabung pada 2012. Agen sbobet terbaik indo11.com - Spanyol berada di puncak klasemen dengan poin 14 dari total enam laga, unggul selisih gol dari Perancis di posisi kedua yang sudah memainkan tujuh pertandingan. Spanyol hanya perlu meraih empat poin dari laga kontra Belarusia dan Georgia untuk memastikan satu tempat di putaran final Piala Dunia. Berita sepak bola terbaru dari Agen Bola terbaik indo11.com - Pelatih Napoli, Rafael Benitez, memuji penampilan tim asuhannya saat mengalahkan Napoli 4-0. Menurut Benitez, timnya sudah menunjukkan karakter dan reaksi atas kekalahan 0-2 dari Arsenal di Liga Champions pada tengah pekan lalu. Terkait dengan kekalahan dari Arsenal, Benitez mengaku timnya tampil dengan intensitas berbeda ketimbang saat menang atas Borussia Dortmund dua pekan sebelumnya. Agen Judi online indo11.com - Eks pelatih Liverpool dan Inter Milan ini pun memastikan tak ada pembedaan antara pemain, meski Paolo Cannavaro kembali dibangkucadangkan dalam laga kali ini. Berita pertandingan sepak bola terkini dari Agen Bola terbaik indo11.com - Paris Saint-Germain (PSG) meraih kemenangan penting, 2-1, saat bertandang ke markas Olympique Marseille, di Stade Velodrome, Marseille, Minggu atau Senin (7/10/2013) dini hari WIB. Kemenangan kontra Marseille membawa PSG tetap menjaga persaingan di puncak klasemen Ligue 1. PSG kini memiliki poin sama, yakni 19 poin, dengan AS Monaco yang memimpin klasemen karena unggul selisih gol. Agen sbobet terbaik indo11.com - Nasib malang menghampiri Marseille pada pertengahan babak kedua. Pada menit ke-64, pelanggaran Ayew terhadap Marquinhos memaksa wasit menunjuk titik putih untuk PSG. Alhasil, kesempatan ini tak disia-siakan Zlatan Ibrahimovic yang sukses menggetarkan jala Marseille lewat tendangan penalti. Pertandingan pun berakhir 2-1 untuk kemenangan PSG.